Porridge is a great winter breakfast, I love to pimp it up with fruit and nuts. 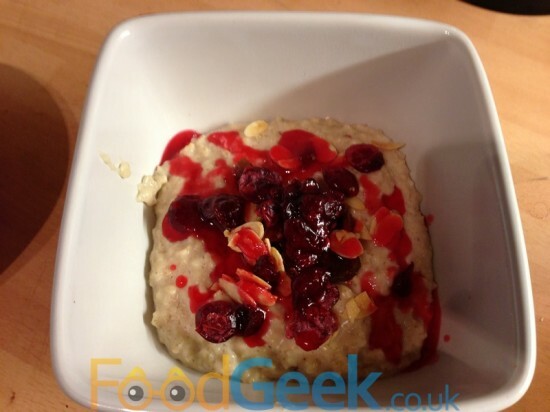 My favourites are blueberries & maple syrup and banana, toasted almond & poppy seeds but at Christmas I like it a little more festive so came up with this Festive Cranberry Porridge recipe. You can make your porridge however you usually do and just add the other ingredients at the end but i’ve included my simple porridge recipe too. 1. Add porridge oats, milk and pinch of salt to a large pan on a medium heat. 2. Bring to the boil then turn to low-medium heat and simmer gently for around 8 minutes until the porridge is thick & creamy. 3. Meanwhile, toast your almonds over a medium heat for a few minutes until nicely golden. When done add a drizzle of honey and remove from the heat. 4. Chop up your figs and dried cranberries. 5. Stir the cinnamon and cloves into the porridge and grate in the nutmeg. 6. When the porridge is ready pour into bowls and add the chopped figs, cranberries and the flaked almonds. 7. Drizzle with cranberry syrup.